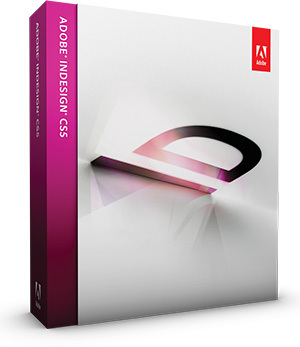 InDesign CS5.5 Now Available For Instant Download! The industry-leading Adobe® InDesign® CS5 provides precise control over typography and built-in creative tools for designing, preflighting, and publishing documents for print, online, or to mobile devices. CS5 introduces new and enhanced productivity and collaboration features. Integrate interactivity, animation, sound, and video in documents and presentations to attract, engage, and inform your audience. Take advantage of intuitive tools that simplify object selection and editing and make page layout simpler and faster. Streamline file management by including mixed page sizes in a single file. Access Adobe CS Live online services* from within InDesign to streamline critical review processes. Cross-media publishing – Publish documents and presentations in print, online, or on mobile devices. Engage and inform readers with interactive documents (SWF) for playback in Adobe Flash® Player, complete with animation, sound and video, interactive PDF documents with video or sound, or sophisticated layouts for print publishing using a versatile, intuitive toolset. Simplified object selection and editing – Perform repetitive layout tasks efficiently. Manipulate frames and frame content without switching tools. Dynamically adjust white space between objects while maintaining the relationship between frames. Use on-object controls to modify frame corners directly in the layout. Integration with Adobe CS Review* – Create and share document reviews online from within InDesign through integration with CS Review, a new CS Live online service. * Invite colleagues and clients to comment using just a browser. Using the CS Review integration in InDesign, you can view comments in the context of your InDesign layout, making it easier to address feedback to meet project deadlines more efficiently. Multiple page sizes – Create pages with different sizes in a single document to streamline file management. Share the same master page across different-sized layouts for greater efficiency. Tracked text changes – Mark up text directly in InDesign and easily track copy revisions. Get to final copy faster by accepting or rejecting text changes within the document. Paragraphs that span and split columns – Quickly format headlines, subheads, or any text to span multiple columns in a single text frame without having to create separate text frames. All-new Layers panel – Easily manage layers in simple and complex documents. Quickly find, select, lock, hide, name, and change the stacking order of individual page items directly in the Layers panel. Drag objects from one group to another. The new Layers panel behavior is similar to the Layers panel in Adobe Illustrator® and Adobe Photoshop®. Preflighting and production enhancements – Speed up production, increase reliability, and deliver error-free documents with document-installed fonts, PDF export in the back­ground, live preflighting, JDF technology, and on-screen controls. Preview InDesign pages and placed images in Adobe Bridge. Find linked assets used in one layout and drag them into another InDesign document using the integrated Mini Bridge panel. Eliminate missing fonts – InDesign automatically installs the required fonts when you open a document and uninstalls them when you close it. Appropriate font licensing is still required. Automation – Create powerful automated workflows to reduce the time you spend on repetitive tasks. Standards-based XML features can automatically lay out pages with text and images. Incorporate databasedriven content for greater efficiency when publishing across channels. Extensibility – Rapidly build unique workflows and software solutions for custom publish­ing using InDesign Markup Language (IDML), an XML-based file format that enables developers to create or modify files using standard XML tools. Digital export – Export your page design and text layouts with greater fidelity to Flash Professional CS5, retaining animation, video, and sound from your InDesign document. Export InDesign content as XHTML with greater control over page order for editing in Adobe Dreamweaver® CS5. Export eBooks authored in InDesign CS5 to industry-standard EPUB files for reading on laptops or mobile devices, including the Apple iPad, Sony Reader, and Barnes & Noble nook. Include rich media to bring eBooks to life when read on a personal computer using Adobe Digital Editions, a desktop reading application. Live captions – Generate static or live captions automatically from image metadata, and add text before or after the selected metadata tag in InDesign. Specify the position and style of the caption, optionally including the caption on its own layer. * CS Live online services are complimentary for a limited time – see details. Plus other good resources like InDesignSecrets.com and TheInDesignGuy.com.